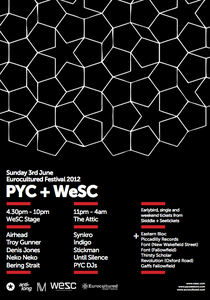 WeSC are hosting a stage at this year’s Eurocultured Festival in Manchester, held this year over the forthcoming Jubilee Bank Holiday weekend. Eurocultured is Manchester’s longest running and most loved street festival that attracts a loyal crowd of thousands each year, drawn to the unique and diverse blend of art, music and performance. 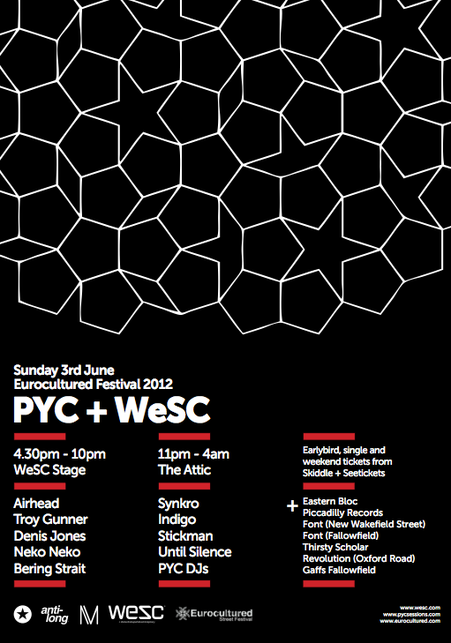 WeSC have teamed up with local collective and blog PYC Sessions and Manchester label Estate Recordings to bring two days of showcases featuring some of the best UK producers and musicians in a truly unique space on New Wakefield Street. Heading up the bill is R&S Records man Airhead, joined on the Sunday by local legend Denis Jones. Rising star Troy Gunner and the hip-hop loving beatsmith Neko-Neko will also feature, with new talent Bering Strait completing the bill. To top that off, WeSC and PYC will be taking over The Attic venue after-hours with a Mindset Records showcase, featuring WeActivists Synkro and Indigo alongside label mates Stickman and Until Silence. The Estate Recordings crew bring their notoriously madcap road-show to the WeSC stage on the Monday, with the most prolific D&B producer of the moment Dub Phizix accompanying fellow Mancunians Chimpo, Skittles and the long serving hip-hop crew Broke‘N’English. WeSC have also teamed up with retailer Urban Industry to collaborate on a mix CD from WeActivist Indigo. The 50-minute mix contains tracks from the likes of Indigo, Akkord, DjRum, Until Silence, Biome and Mindset records colleagues Troy Gunner and Synkro and is available from Urban Industry online and instore as well as from the WeSC store on Carnaby Street, London with any WeSC purchase.